In 2003 when the world famous street artist, Banksy was 27 years old he visited Melbourne. In keeping with his secretive nature it was an unofficial visit and different from Keith Haring’s visit. (See my post about Keith Haring in Melbourne for more about early visiting international street artists in Melbourne.) Details of the visit are still sketchy. Puzle of Burn Crew (a T-Shirt label) showed Banksy around Melbourne. Banksy had met Puzle and the rest of the Burn Crew at Semi-Permanent. “Puzle” now works as freelance art director and designer in Melbourne. Banksy and members of Burn Crew did a couple of missions spraying rats in various suburbs doing a couple of Little Divers, one in Brunswick and one in the CBD and lots of rats. Spraying policemen kissing in St.Kilda and various pieces around Revolver in Parhan. The greatest impact of Banksy’s visit to Melbourne has been to expose the hypocrisy of Melbourne City Council towards street art. The City of Melbourne has used Banky’s parachuting rat (yes the one that council workers destroyed in Hosier Lane) to promote the city in their publication Hot Spots Winter 20011 (City of Melbourne, June 2011). P.S. 29 October 2013, another Banksy bought the buff this year (see the report in The Age). I’m not very interested in the continuing story of Banksy in Melbourne. His influence, if he ever had much, has run out in Melbourne. Street art was not intended to last forever and it is almost surprising how many Banksy’s have survived this long. This entry was posted on Monday, July 4th, 2011 at 1:23 AM	and tagged with Banksy, Burn Crew, Melbourne, Melbourne City Council, Nicholas Building, Parhran, stencil art and posted in Art History, Street Art. You can follow any responses to this entry through the RSS 2.0 feed. The City of Melbourne just don’t seem to be able to grasp the concept of street art, continually bumbling decisions in relation to it. 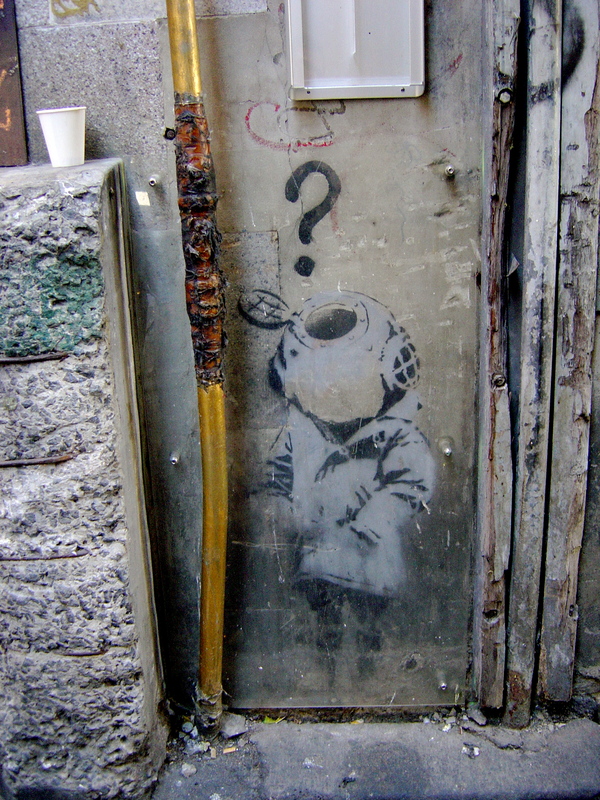 This has never been more evident than in the case of Banksy – on the one hand, they ‘attempt’ (and fail) to preserve the Little Diver in Cocker Alley and on the other, less than one block away, they paint over his parachuting rat in Hosier Lane. Their ‘Street Art Permit’ system is a poor and uninformed attempt to control the uncontrollable. According to their ‘Graffiti Management Plan’, any art that does not have the permission of the building owner is classified graffiti and will be removed. This is a joke as most building owners could not give a fig about what is on the back of their building in the lane, nor should the City of Melbourne ever be bothered wasting money painting over it. Yes, there are a minority of loud mouthed residents who are offended by it but surely they must ask themselves why they moved into the city in the first place. If it is a sterile environment that they crave, the Docklands is always open. The ‘Union Lane Street Art Project’ was a step in the right direction, however they bizarrely covered it with a (very expensive, in the many thousands of dollars) anti-graffiti coating! By the way, their are a couple more Little Diver’s in Melbourne – both in the back streets of Prahran. Here’s hoping Stonnington don’t follow in the footsteps of their bigger city brothers. Fantastic post Mark, great to see some info about Banksy’s visit to Melbourne (amazing that no one has ever done it before)! Thanks, James. I had to write it before all the evidence disappeared. And thanks for a great summary of the City of Melbourne’s action on street art. 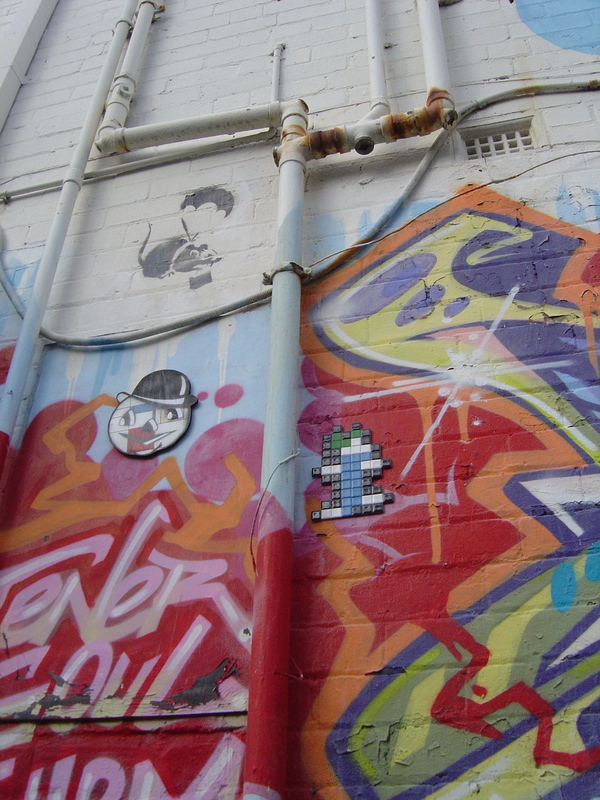 In regards to the City of Melbourne words fail me – Alison Young has written more about their failure to come to terms with one of Melbourne’s biggest tourist attractions – its street art. For international readers it would be well to point out that the City of Melbourne Council is unaccountable to most people living in Melbourne, only the people living in the inner city (along with property owners in the inner city?) get to vote for the council – hence the power of the few residents. And that even if they could vote both major parties have equally bad policies in this, and so many other areas, as has been demonstrated with the recent change of leadership in the Melbourne City Council. I am curious to locate the other little divers that are in the back streets of prahran. I’m not that familiar with the back streets of Prahran but I know that there are a few rats in there. 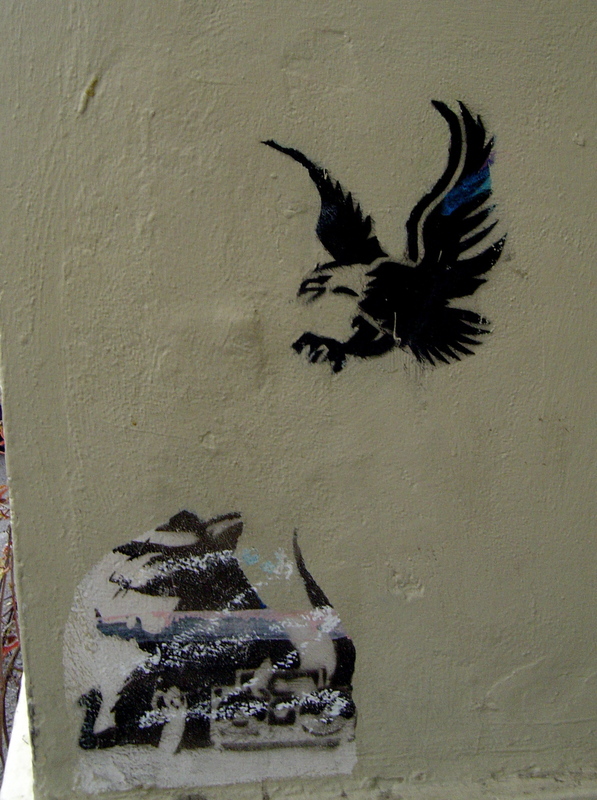 When I saw the Alex defacing Banksy link, my eyes almost popped out of my head. What an amazing opportunity for a new street art piece! But as I tried to find the original source of the photo, I found another link, claiming poor Alex is actually an innocent victim of sensationalism on the internet. Thanks CDH for doing that follow up research. The original photo of Alex in the original blog entry didn’t look right with a paint brush in his hand in front of an aerosol painted wall. Hi Mark, great post – really excellent to read an account about Banksy’s visit here all those years ago, and thanks for the shout-out. I actually spent some time with Banksy when he was here and did a couple of pieces with him. Finally someone comes forward. Can you give any more details? How you meet up? What else did you do together? Hi Mark, I’m a UK artist who’s recently moved to Melbourne. I find your articles on the Melbourne street art scene very insightful however I don’t think Banksy deserves the time of day here. In 2003 I sublet a run down warehouse to him for his Turf War exhibition in London. Here I got to know first hand how his PR machine (Pictures of Walls – POW) works. His team had arranged for a so called Animal Rights protestor to chain herself to an animal pen (Banksy had sprayed painted some sheep they had hired). They called in the press association so that they would arrive on the scene as it happened. The next day the news was in all the newspapers. I witnessed Banksy and his promotor selling his art works to Japanese businessmen. The show was sponsored by Puma (I got some free trainers out of them). This was not an act of a so called anti capitalist/ anti corporate street artist. Banksy knows all about the sponsorship and selling of his art works to corporates, his best friend owns POW so presumably Banksy is on their payroll. 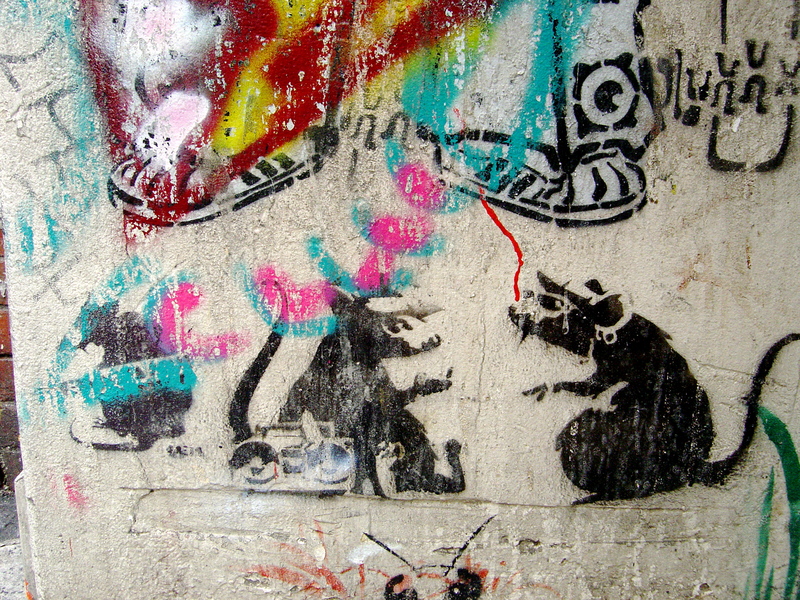 WIth the artwork itself, we cannot ignore the rip offs from the work of Blek Le Rat. Although Banksy’s does add some of his own originality to these, I would say that generally Banksy is a con artist who has worked his way to the top of the street art scene by careful manipulation. This is definitely him.. Robin Gunningham! he uses the name robin banks in public. Doesn’t surprise me that he has a public schoolboy (non state school) upbringing. Pubilc vs Private? What are you referring to? Countless entrepreneurs have successfully inundated the ‘i went to a private school; superiority complex’ and challenged the status quo. ie. college drop out Steve Jobs. Keep living your narrow minded life and watch all the Genius in this world evolve, private or public educated. Love Banksy work, but unless it’s commissioned and approved of it’s still just vandalism. Also note that the other mindless fwits who think they are ‘artists’ don’t even know what a ‘Banksy’ is and they just mindlessly scrawl and tag over each other, including Banksy stuff. It’s just lowering yourself to their level to prove that its just graffiti! There’s no respect even amongst their own, just like the ‘so called’ religions who think their ‘god’ rules! It’s just a round circle of disrespect.